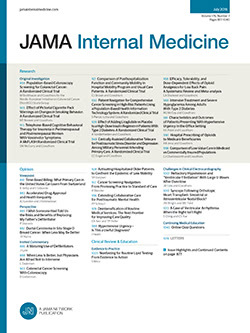 With the January 13, 2003 issue, the Archives of Internal Medicine introduced photographs as cover art for the journal. Do you have a scenic photograph you have taken that you think would make a great cover shot? Submissions should be from our readers, reviewers, and authors, and must be formatted horizontally. They should be in color and at least 3.5 × 5 in but no larger than 8 × 10 in. Due to legal concerns, no recognizable people should appear in the picture. Please include your name and address and where the picture was taken. Send submissions to Archives of Internal Medicine, 1840 E River Rd, Suite 207, Tucson, AZ 85718. Cover photos will be chosen at the discretion of the ARCHIVES editorial staff. We look forward to seeing your photo on the cover of a future issue of the ARCHIVES!